Pokémon has made a strong comeback 20 years after its initial release in the form of a social media sensation, Pokémon Go. Nintendo first released Pokémon in 1996 in Japan where Satoshi Tajiri, the creator, and Ken Sugimori, the artist, were junior developers at. The game was later released in the United States in 1998 where it found great success. Now, the developmental giants at Niantic Labs, the Pokémon Company, and Nintendo have revived enthusiasts’ old love for the characters and friendly-competition with Pokémon Go. All players need is a smartphone with GPS and camera capabilities. Currently, Pokémon Go is the most profitable app on both the Google Play Store and Apple App Store, and Nintendo’s stock is going through the roof. At this time, the game is restricted to the US, Australia, New Zealand, UK, Canada, and Germany, with other locations becoming available day by day. So how does this impact the day-to-day of the restaurant industry? 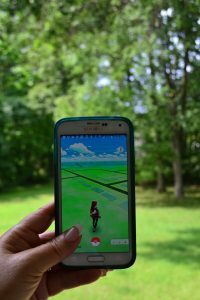 Many business owners may look at Pokémon Go as a distraction to their business. Something that will have gamers popping into their restaurant just to catch a rare Water Pokémon or Pikachu. They will roam the waiting area, pretend to look at the menu, only to leave and cause a distraction amongst the paying customers. It doesn’t have to be this way. Pokémon Go augments a user’s reality to include these collectible creatures. So why not be an asset to them? Pokémon Go can be used to your restaurant’s advantage; you just have to find what is the best method for your business. Already there are businesses that are seeing increases in their numbers because of this game. Pokémon Go is a chance for restaurants to build community presence and increase traffic (and sales) by a fairly simple means. Become a Pokéstop or gym. Set up a food truck or stand. Pokémon Go has elements similar to geo-caching, the biggest one being you physically must be in that location to play the game. If you have a town square or park that is open and already frequented by Pokémon trainers, this is a great opportunity for your business. A food truck or stand can be put in these locations to promote your restaurant. Walking around can certainly work up an appetite, hungry trainers will thank you. This can be especially useful if you have a small brick and mortar location and still want the opportunity to bring your name and products out into the community. Even something small like a coupon card that promotes your business being Pokémon-friendly could make a difference. The rewards can be great for restaurants who get out in the community and involved in this trend. Make an experience out of it. The more ways you advertise that your establishment is a Pokémon-friendly environment, the better. Create specials like the “Bulbasaur Bruschetta” or “Horsea Ham Sandwich on Rye” to entice hungry players that come for the creatures and stay for the food. Integrate your social media with Pokémon Go by making a rewards program that offers guests an incentive if they post a Pokémon Go pictures from your location and tag you. Enlist a coalition of businesses around you to host a Pokémon bar crawl or food walk. This way you can get a larger group on-board and have a wider range of resources to work with. Your avenue of creativity and level of involvement is completely up to you as a business. Use Lure Modules to attract Pokémon and customers. One of the most reliable ways to attract Pokémon Go players to your restaurant is to purchase a Lure Module. A Lure Module will bring Pokémon to a specific Pokéstop for 30 minutes, meaning any player at the particular location can catch them during that time frame. Restaurants can use these to appeal to trainers during slow periods of the day, with the goal being to turn them into customers. One Lure Module is 100 Poké coins for $0.99, making this a fairly cheap way to attract the Pokémon Go crowd. Other businesses are going so far as to letting their customers know when they’re going to be using a Lure Module. This gives trainers a definite location and time of when the Lure Module will be used so they can be prepared. If you have a big event coming up, let know your social media followers know a Lure Module will be in place so they can come and take part in it. Using this method of advertising, you can physically bring Pokémon players into your location and have them enjoy what you have to offer as a restaurant. Pokémon Go allows restaurants and businesses to interact with their guests like never before. As a business, you will have to make the call whether this a trend you want to take part. If you have the creativity and time to plan on how you want to use this game to attract customers, it could be worth your while. Just remember, opportunities to drive massive traffic to your establishment don’t come around that often, and you have to take advantage of them when they do. *07/25/16 UPDATE: Pokémon Go is no longer accepting submissions for new Pokéstops or Gyms due to an overwhelming influx of submissions. Changes such as trading, breeding, and more sophisticated Lure Modules are in the works for players as the app evolves. Check back as this is subject to change! The link you provide to become a stop or gym states none are being added. Hi Vicky, they recently just stopped accepting submissions for PokéStops/Gyms at this time. Thank you for your feedback, since this app is still new they are still in the process of making frequent changes. It is to my understanding they received an overwhelming response of submissions and need to work through those before accepting new ones again. Definitely check back for updates!